"I well remember the Christmas card effect of the dust-covered roofs and roads - so white and thick it looked like snow. And how, when we fell flat because of a passing bomb, we were white with dust when rising. Someone even said: 'It's snowing', but it was only the dust, dust, dust of shattered buildings." This was the reality of war for one local resident, Mrs Verena Simmons. Following the declaration of war on September 3, 1939, the borough experienced months of uneasy silence, known as the Phoney War, before aerial bombardment by the German Luftwaffe actually began. Some residents were parted from loved ones, and all learned to endure black-outs and rationing. Many installed portable steel Anderson air raid shelters in their back gardens, but for others it was simply a question of waiting and dreading the worst. The local authorities built larger air raid shelters throughout the area, erected first-aid posts and ordered vast quantities of medical and surgical supplies. Many civilians volunteered for ARP or Civil Defence duties. 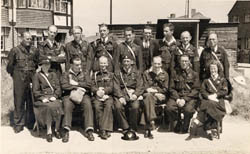 Others joined the Home Guard, became fire watchers, or raised funds towards the purchase of two Spitfire aircraft, known as the 'Twickenham Spitfires'. A number who owned boats even participated in the evacuation of Allied troops from Dunkirk in June 1940. The first bomb to strike the area was dropped by the Luftwaffe on the night of August 24, 1940, during a raid on the oil refineries at Thames Haven. The high explosive device completely destroyed the home of Frederick Reynolds at 153 Tudor Avenue, Hampton. Although Mr Reynolds and his wife sustained injuries, both had a miraculous escape. Their house had been reduced to a pile of smouldering rubble. The bombing of the borough then began in earnest. In September 1940 the authorities recorded 274 'incidents' - the official term used to describe an exploding bomb. Perhaps the most spectacular of these incidents was the complete destruction of Radnor House, a grand two-storey villa overlooking the Thames at Cross Deep and Popes Grove, Twickenham (now the site of Radnor Gardens). On the night of September 16, 1940, a single 250-kilogram bomb landed on the house, penetrated to the cellar, and exploded two hours later. An eerie, rubble-filled pit in the ground was all that was left of the enormous Italianate mansion. Concern ran high at the end of October 1940, when a bomb landed on the apron of Teddington Weir. The breach caused by the bomb's detonation created a reduction in the depth of water at Teddington Reach by six feet, making navigation impossible except at high tides. Those dwelling on Trowlock Island were marooned temporarily. Full navigation of the Reach would not be restored for seven weeks. In the months that followed, the aerial bombardment grew heavier. November 1940 saw the borough sustain its highest casualties. 74 people were killed, the majority in a devastating attack which took place on the night of November 29. 130 bombs and between 3,000 and 5,000 incendiary devices rained down on Twickenham and Teddington, destroying 150 houses and damaging more than 6,000 others. 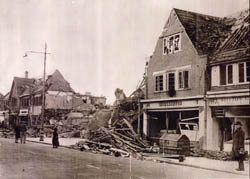 The worst damage was sustained in Church Road, Teddington. 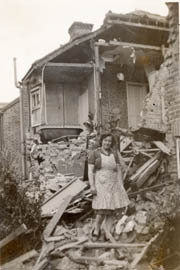 Mrs Lilian Dring, a Teddington resident, wrote: "Most of Teddington became a raging inferno. Duty rotas were abandoned and every available warden was on duty most of the night. The Baltic Timber Yard, Stanley Road and the Baptist Church went up in mountains of flame which almost met over our heads as we patrolled Walpole Road." Another tragedy occurred the same night. Bombs intended to pulverize the National Physical Laboratory at Teddington exploded over a public air raid shelter in the laboratory's grounds, killing eight residents of Walpole Crescent. The NPL had been designated a special target by the Luftwaffe, as it was here the engineer and aeronautical designer Barnes Wallis was developing the 'Bouncing Bomb', later to be used by the RAF in the famous Dambusters raid of May 1943. The raid destroyed Germany's Mohne and Eder dams. The borough received a much-needed respite from bombing in June 1941, when Luftwaffe squadrons were ordered to concentrate on the war against Russia. The resumption of Hitler's bombing of England, a period known as The Little Blitz, did not occur until the spring of 1944, when raids were launched from Luftwaffe bases in occupied France. As far as residents of the borough were concerned, the worst of these raids occurred on February 25, 1944, when 45 bombs were dropped in an effort to destroy both the National Physical Laboratory and an American army base in Bushy Park. The Luftwaffe missed their targets. Three bombs fell in Fulwell Golf Course and 28 landed in Hampton and Hampton Hill. Nights when German bombers transferred their attack to London left no respite for local residents. Verena Simmons wrote: "I fear poor London is having a dreadful time. The roar of planes has never stopped since nine last night, and guns have been busy nearly all the time. There are huge banks of red smoke all over the east in an otherwise clear sky." On that particular night - April 17, 1944 - 900 tons of high explosives were dropped on the capital and 1,200 people lost their lives. The worst attacks of the war were yet to come. In the summer of 1944, V1 and V2 rockets, unmanned 'reprisal weapons' containing high explosive warheads, were launched from sites in the Netherlands and France. Known as buzz bombs or doodlebugs, the V1's were a terrifying addition to Hitler's arsenal. They could be launched in all weather conditions, at any time of night or day, and they destroyed indiscriminately. A doodlebug that landed at the corner of Water Lane and Twickenham Embankment on June 19, 1944, bounced 37 feet before entering and destroying the residence known as Gotham Villas, killing six residents including a Thames pilot waterman. On the same evening, another V1 landed at the corner of Cross Deep and Holmes Road, Twickenham, killing four and demolishing the Pope's Grotto Public House. Teddington Film Studios, one of the few British studios to remain in operation during World War II, received a direct hit from a V1 on the evening of July 5, 1944. The bomb completely gutted the main studio and took the life of 'Doc' Salomon, the studio's American production manager. This effectively put an end to Teddington Studio's valiant efforts to produce morale-boosting films throughout the war. Understandably, the psychological impact these missiles had on the local population was devastating. An even greater threat was posed by the sophisticated, longer-range V2 rockets. Unlike the V1, which could be seen and heard from a distance, the V2 was silent and there was no warning of its arrival: it simply dropped to the ground and exploded violently on impact. The only V2 to land in the area, at the rear of Fairfax Road, Teddington, left a crater 40 feet wide and 8 feet deep. Fear of this new menace from the skies led to the evacuation of 7,000 women and children from the borough in July 1944. When the borough celebrated VE Day and hostilities ended in August 1945, local residents could sit back for the first time in five years and take stock of the damage. 143 civilians had been killed in air raids. 500 houses had been destroyed and another 32,000 residences had sustained damage. The process of rebuilding would try the patience of many. Verena Simmons wrote: "Teddington is a disgrace and looks more so in the sunshine. More and more empty shops and if they have not been shocked by bombs they are left in a mess." Nissen huts were hastily erected by the local authorities in Seymour Gardens, Twickenham and Little Queen's Road, Teddington as temporary accommodation for the 462 people who had lost their homes, but these were not an ideal solution. "We want homes, not billets" became the common cry. The people of Twickenham and Teddington, who had already endured so much, were to experience further hardship and deprivation in the post-war reconstruction process before the tragic loss of life and property became a distant memory.